Famously known in racing circles as 'The Earl of Speed', Phil Read was the first rider to achieve the triple honor of winning the 125, 250 and 500cc categories. In all, the Brit wook seven world titles, but for some racing fans he will always be best remembered as one of the original rebels of motorsport. Born in Luton, England in 1939, this smiling and elegant rider who was a lover of luxury (he went to the tracks with his white Rolls) practically closed the glorious MV world championship cycle. 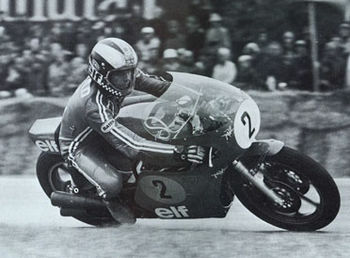 MV called him in 1972, after he had already won five world titles with Yamaha, not only because of his class and experience, but also owing to his disposition. He was combative and meticulous, and impatient of secondary roles. The 1968 season would go down in history as one of the truly great GP battles. While Giacomo Agostini cleaned up in the larger capacities, Read and Ivy fought for every inch of tarmac in all the lightweight events. By the closing races, Read was set to take the 125cc title while Ivy was on course for the 250cc crown. However, Yamaha were concerned that the fierce struggle between the two riders might stop the team from winning the 250cc title again. As a result, the company decided to make an executive decision: Read would take the 125cc title and would support Ivy in his quest for the 250cc crown. However, after his disappointments of the year before, the more experienced rider decided to disobey his team's orders and took the 250cc title as well. Ivy had to settle for 2nd in both categories and was understandebly furious. It was precisely this aspect that made him an interesting stimulus for Agostini, who was anything but in disarmament, but who was too fearful of the Japanese offensive. Read raced in 1972 with the 350, getting good results, and in 1973 with the 500 where, with full leeway, he was able to capture the title with Ago coming in only third. He was left MV's only leading man in 1974 and confined himself to just the top class, winning the title again without much difficulty. That was the last world trophy for the Cascina Costa manufacturer. He retired from the World Championship at the age of 37 after 16 years at the top. This page was last edited on 21 January 2011, at 04:44.